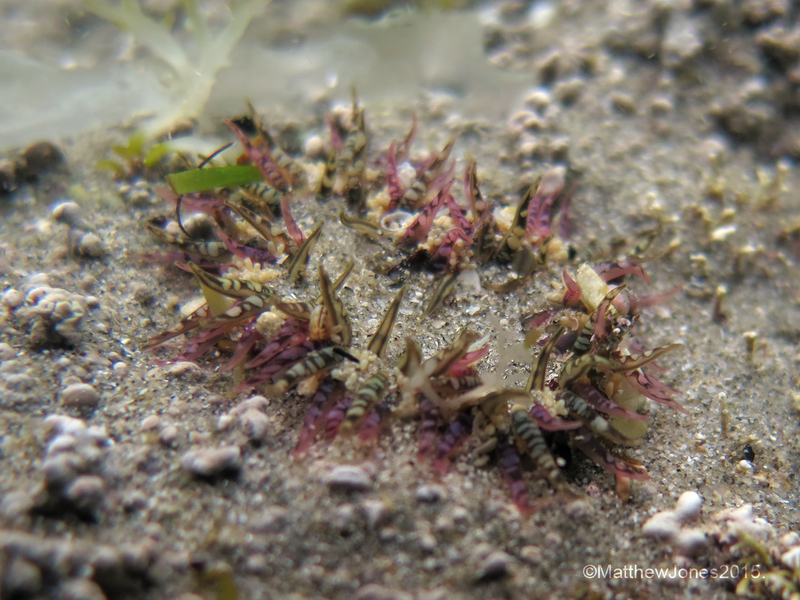 An unofficial guide to sea anemones from the Auckland and Tauranga regions of New Zealand. The speckled anemone — Oulactis muscosa (Drayton in Dana, 1846), is found throughout New Zealand, but also found in southern Australia, Chile, and there’s also a record from China, which maybe dubious. They are ofter found low-tidal rock pools and between rocks in sand. 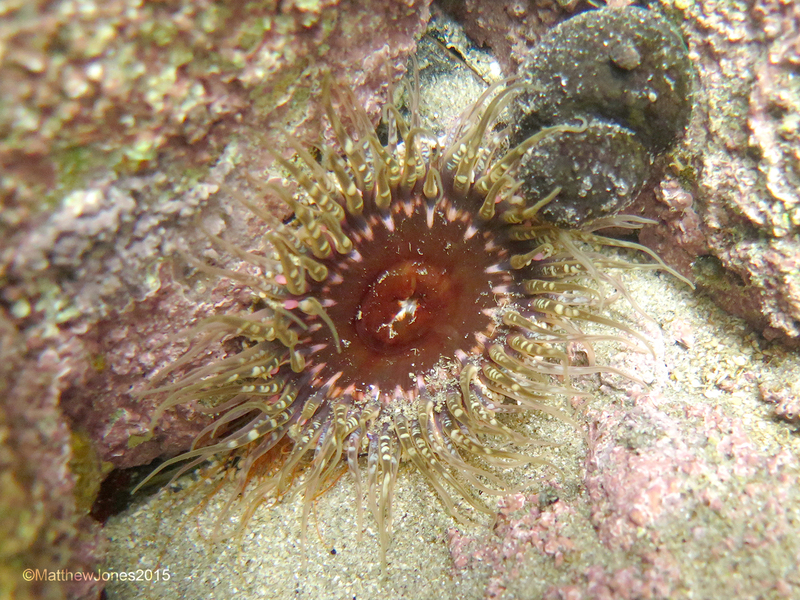 Is a medium-large anemone (~60 mm across). The oral disc is usually a brick-red colour (but can be orange) and the tentacles are speckled and striped. The giant sand anemone, but speckled anemones are a bit smaller. The oral disc (the round bit looking down at the anemone) is usually a brick red (or orange) colour in the speckled anemone, but it can be several different colours in the giant shore anemone. 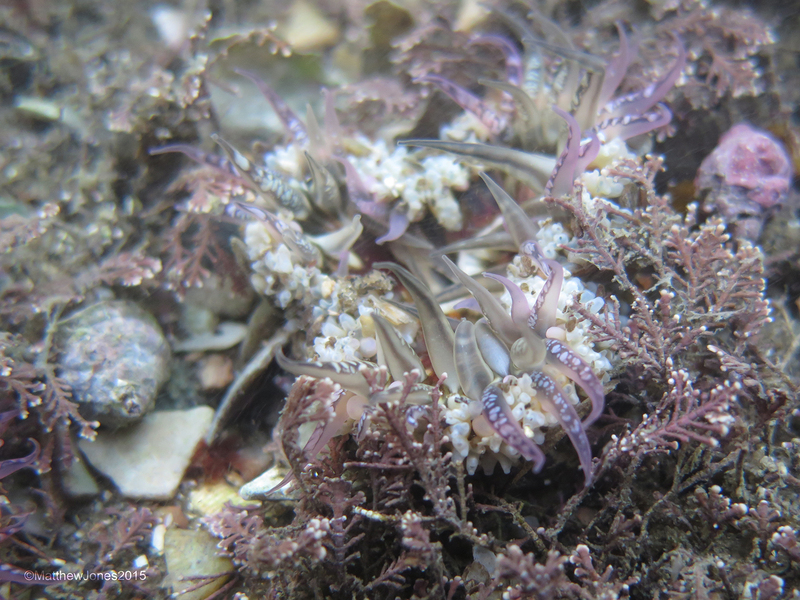 Speckled anemone’s tentacles are speckled and striped (hence the name). 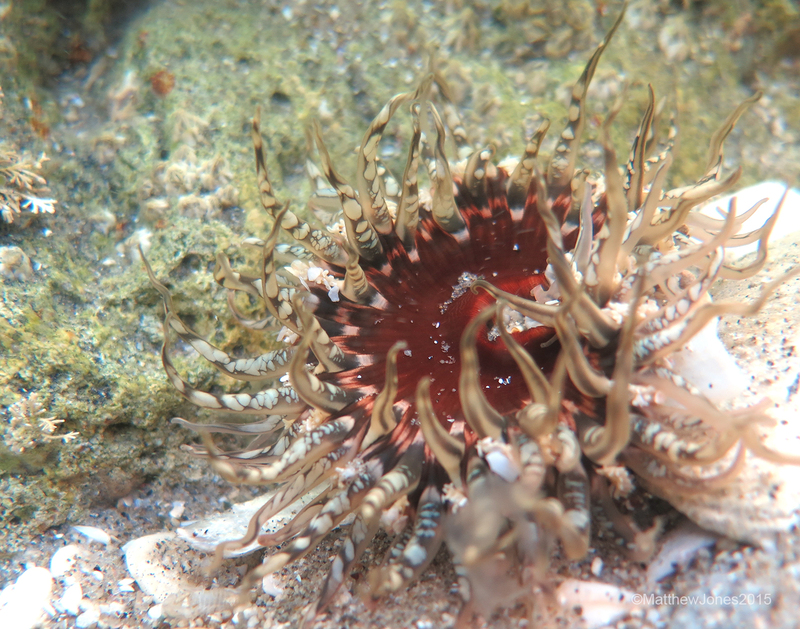 The giant shore anemone seldom has speckled and striped tentacles. 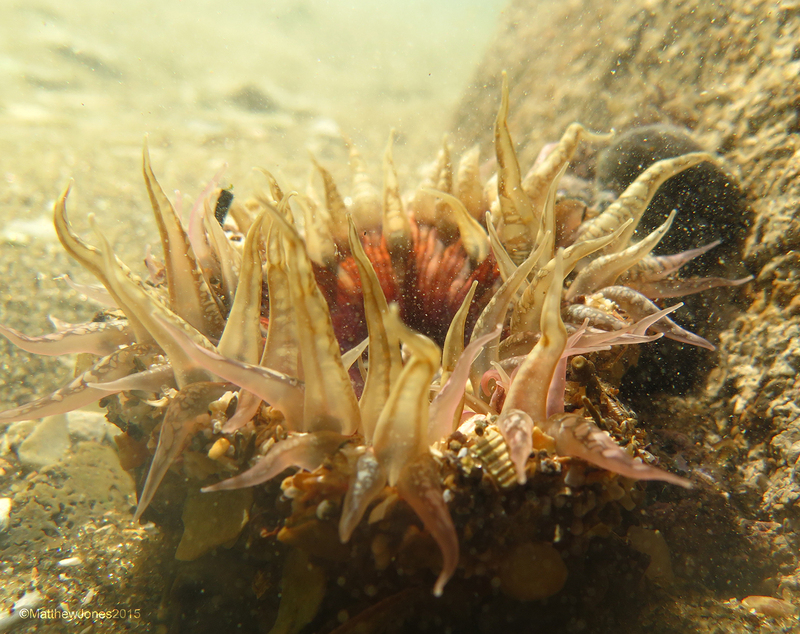 Speckled anemones have oddly bent, almost crinkly tentacles and this seems to be a consistent diagnostic feature, especially when distinguishing them from giant sand anemones. Colour is usually an unreliable discriminator when it comes to telling one species from another. In the past many alleged species have turned out to be just colour forms of the same thing. 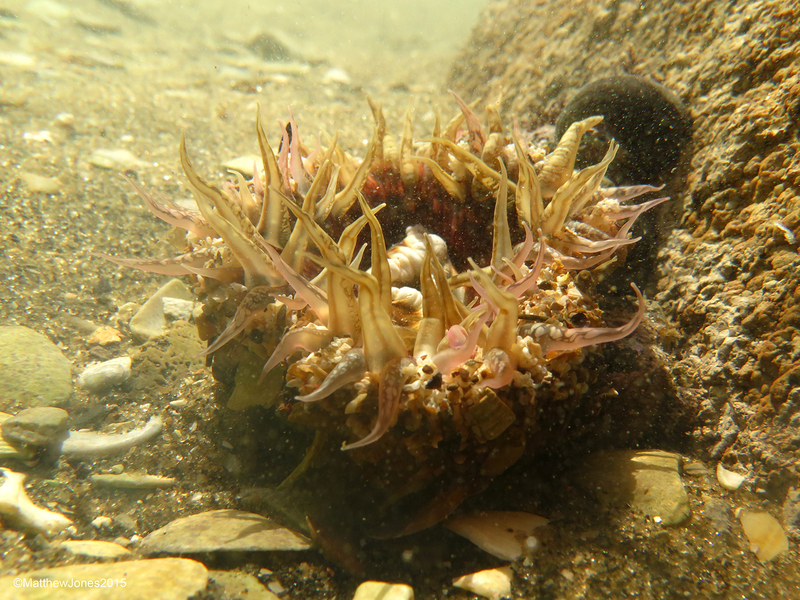 Speckled anemones are can be found in same sorts of places as the giant shore anemone (low tidal rock pools), However, they are more commonly found in areas with a bit more shelter. Like the giant shore anemone, they also attach pieces of shell to their stalks. From between rocks at the base of Mt. Maunganui, October 2015. This photo shows the weirdly bent tentacles quite well. From just below low-tide, Pilot Bay, Mt. Maunganui, August 2015. This one is partially hidden, nestled amongst pink coraline algae. From just below low-tide, Pilot Bay, Mt. Maunganui, August 2015. This and the next shot were taken in late afternoon light, hence the warm orange tones. This and the next picture clearly show the striped tentacles. From just below low-tide, Pilot Bay, Mt. Maunganui, August 2015. From a mid-tidal rock pool on Moturiki Island, Mt. Maunganui. This clearly shows the brick-red-coloured oral disk and speckled/striped tentacles. Partially buried in sand, from rock pools at the base of Mt. Maunganui, October 2015. This entry was posted in Mt. Maunganui, New Zealand, Oulactis muscosa, Piha, Sea anemones, Speckled anemone and tagged anemone, New Zealand, Oulactis magna, Oulactis muscosa, Speckled anemone. Bookmark the permalink.